Have Games Discovered a New Way to Harness the Influence of Celebrities? Video games and celebrities have a long but rather checkered history. From beloved British comedy duo Morecambe and Wise promoting the Atari 2600 in the early 80’s to the present day where games publishers pay millions to have celebrities either endorse or appear in their games, the results of harnessing the influence of famous personalities have been mixed in the response of their audience. While the likes of Ricky Gervais performing an in-game stand-up routine in “Grand Theft IV” was mostly to the delight of players, Peter Dinklage’s voice performance in “Destiny” met with so much derision amongst its player-base its developer Bungie replaced the “Game of Thrones” star’s dialogue entirely with the ubiquitous voice-talents of Nolan North in a later update. Tying in the presence of a well-known star can be a risky proposition and expenditure for games companies. However, on March 14th this year a new, more holistic method of utilising celebrities to generate attention for video games unexpectedly emerged via the games streaming platform, Twitch. The Amazon-owned streaming platform, Twitch, caters exclusively for gamers broadcasting their playtime to millions of viewers around the world. It has become an extremely advantageous outreach avenue for many games as it has a high appeal to key age demographics for the gaming audience. 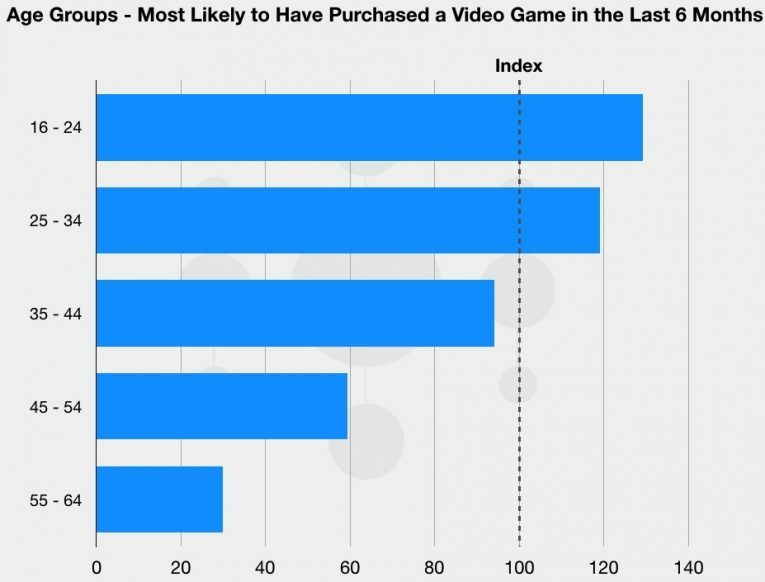 We can see above that younger age groups, 16 to 24 and 25 to 34, are more likely to have purchased a video game in the last 6 months and this trend is reflected in the likelihood of the same age ranges engaging with Twitch. No game is benefitting more from Twitch’s influence currently than Epic Games’ free-to-play title, “Fortnite: Battle Royale”. The unique online shooter-builder hybrid enjoys the top spot on the streaming service with some 270,000 viewers watching 13,000 channels broadcasting the game at the time of writing. 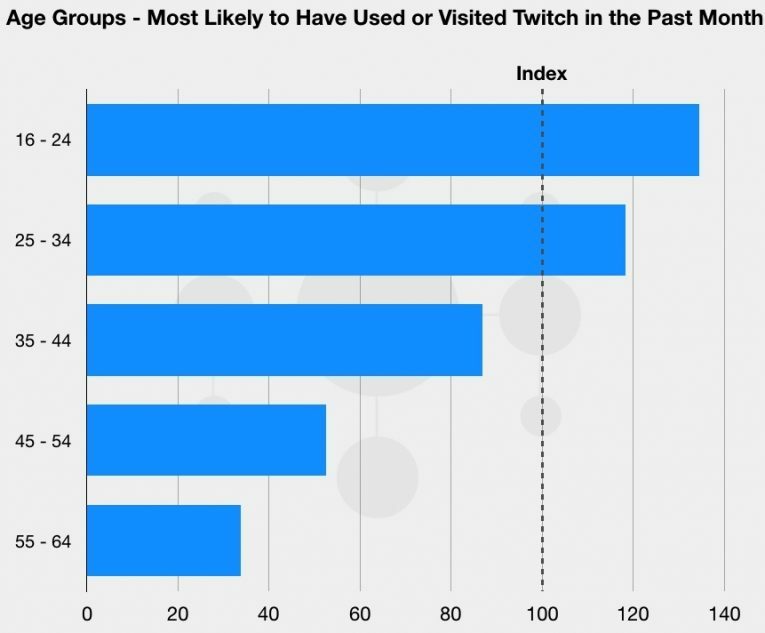 Crucially, the game also features on the most partnered channels (subscription-based channels run by the platform’s most popular streamers) the most prominent of which is esports pro, Ninja (Tyler Blevins), who is followed by over 5 million Twitch users. Ninja has become a celebrity in his own right in gaming circles thanks to his popularity on Twitch. Such is Blevins’ gravity as an influencer he managed to attract a very special guest to join him on his stream of “Fortnite: Battle Royale” on March 14th. One of the biggest driving factors attributed to Tyler Blevins’ popularity on Twitch is his channel and commentary is free from the toxicity and ranting generally associated with many of his peers. He is perceived as not only a highly-skilled player but also as a refreshingly pleasant personality who retains his sunny disposition even if his gameplay is not going to plan (which is not often). So it is somewhat fitting when he was joined on a regular Fortnite session by one of rap music’s most affable stars in the shape of famed Canadian rapper, Drake. 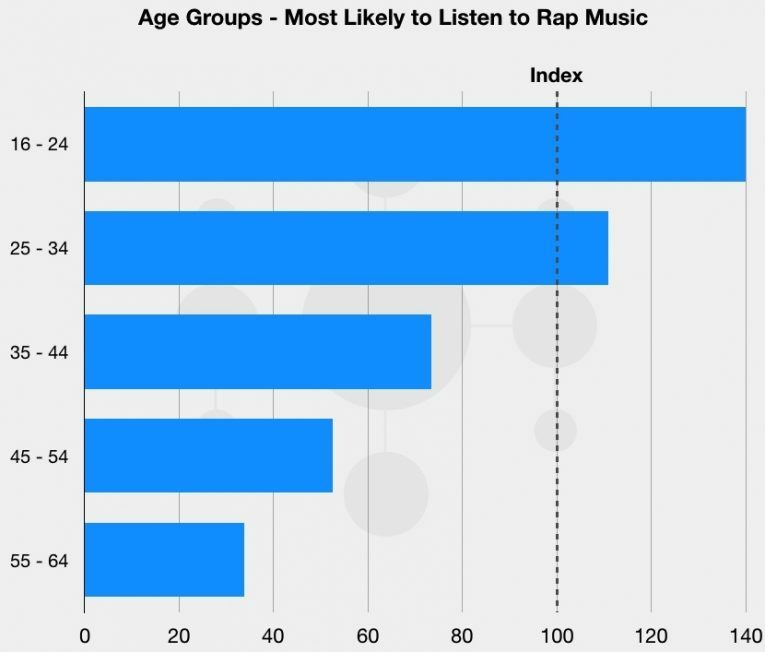 This unexpected team-up to play gaming’s most “a la mode” title should also have had considerable appeal to Twitch’s audience as we can see with the younger demographics higher likelihood to listen to rap music, especially within the crucial 16 to 24 range. 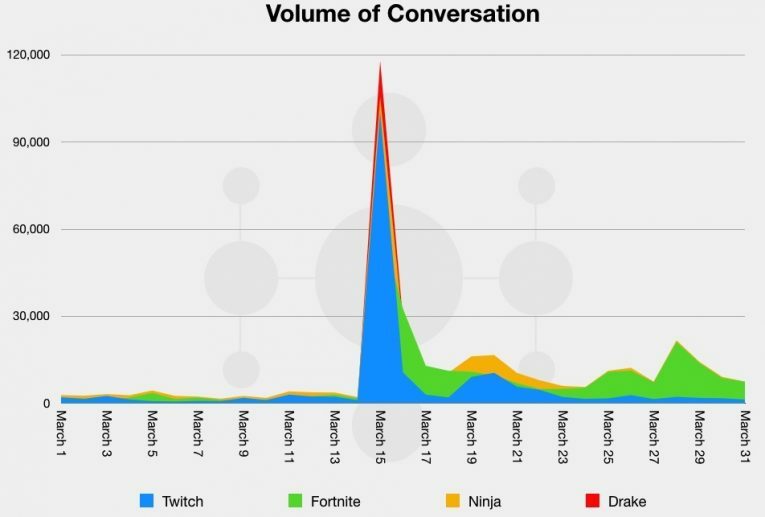 Not only did this stream set a new milestone on Twitch for the most concurrent viewers on an individual’s channel – the peak viewership was counted at 628k - the resulting spikes in conversation share on social media for the stream’s participants, Twitch, and Fortnite itself were just as remarkable. 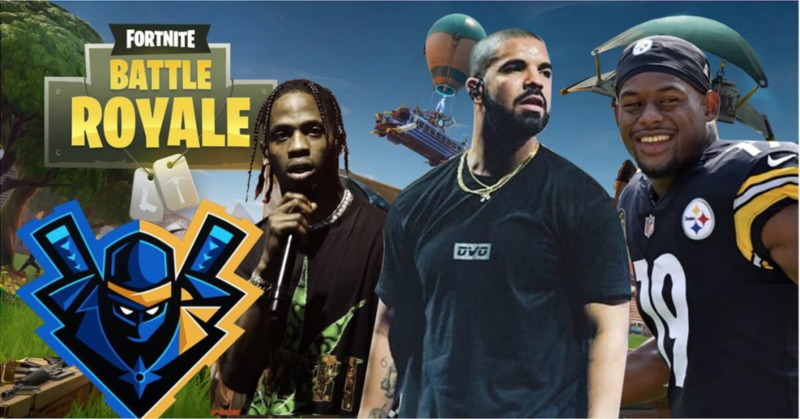 With news of the impromptu team-up between two of the famous stars in gaming and rap spreading like wildfire, Ninja and Drake were joined in-game by the NFL’s Travis Scott and Juju Smith-Schuster. This suggests this seemingly organic event (Epic Games have publicly denied any involvement in the session) presents a new and highly viable method to bring celebrity influence to gaming with viewers able to engage directly with celebrities on Twitch – or even in the game itself - providing a tantalising appeal for the gaming audience. But how does this new approach of holistic celebrity endorsement compare to the more traditional methods employed by games publishers? By analysing the conversation generated by two Triple-A game releases featuring high-profile stars, we can deduce some of the influence of the respective celebrities appearing in the games. As we can see above, the A-list actress features heavily in the conversation share suggesting that her casting in the game drew significant attention from its audience but the game’s exclusive status for the PlayStation 3 was clearly the most noteworthy subject in the conversation. However, our other example fares less well when it comes to the prominence of its star. The above word cloud represents the most commonly used phrases on social media during the release of “Call of Duty: Infinite Warfare” in November 2016. The futuristic shooter starred Kit Harington of “Game of Thrones” fame, although it would be difficult to ascertain this from the conversation alone surrounding the game on its release with Harington’s name achieving little recognition on social media. Admittedly, this particular entry in the Call of Duty franchise was dogged by controversy leading up to its release but it should still be disappointing to its publisher Activision that their investment in a big name seemingly failed to resonate with its audience. It is also clear to see the excitement generated by the involvement of Drake and the two NFL stars with the phrase “time to be alive” gaining significant traction in the conversation. This could be attributed to the novelty and surprise of the event but there is no denying the effectiveness of optimising the game as a brand with the celebrities involved – and the publisher did not spend a dime in doing so. If we compare Fortnite’s success with celebrity endorsement to another games industry standard of bringing celebrities on stage during promotional events to play a new title, we can see that the Twitch session offered considerably more synchronisation with the game's brand and the famous personalities involved. At E3 2016, Electronic Arts employed Zac Efron and Snoop Dog to help promote the upcoming release of WW1 shooter “Battlefield 1”. The battle for attention during E3 is fierce among game titles and while the military shooter’s title features heavily in the conversation share, though Zac Efron’s and Snoop Dog’s involvement achieved less recognition in the conversation. That the two stars did generate some awareness demonstrates it was a worthwhile approach but it lacks the near-perfect symmetry of brand and celebrity we saw during March for “Fornite: Battle Royale”. Evidence suggests Ninja and Drake’s Twitch session has so far proved to be the optimum marriage of a gaming brand with celebrity influence. In doing so, it has potentially set a new precedent for gaming promotion, of which we are likely to see much more of in the future.